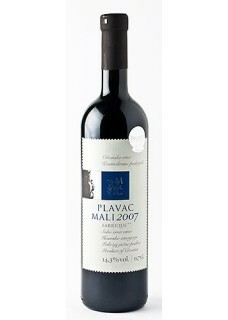 Plavac mali is above all the product of its terroir or the sum of natural influences in the vineyard. The extreme conditions of the steep and sunny slopes on the south side of the island of Hvar impose the organic approach as the only choice – in other words, manual labor, with minimal intervention in natural processes and resulting in small yields of the highest quality grapes. The natural intensity of the varietal aroma of the dark and ripe fruit is rounded up by aging the wine for 8 to 12 months in a combination of French, Slavonian and American barriques. The final special quality of our Plavac mali lies in its "French" type of elegance, as this wine has a tendency towards preserving both the classic of the aromas of Plavac Mali, as well as the style of the Old Continent wines, focused on the structure, complexity and the duration of flavour. Food pairing: Spicied dishes, roasted meat or steaks.